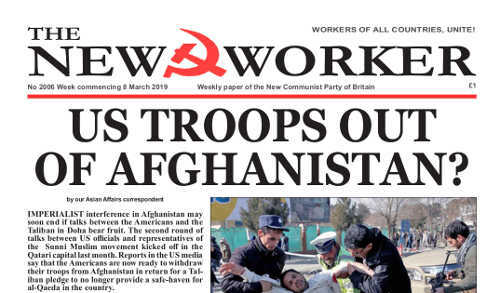 www.newworker.org | US Troops Out of Afghanistan? US Troops Out of Afghanistan? IMPERIALIST interference in Afghanistan may soon end if talks between the Americans and the Taliban in Doha bear fruit. The second round of talks between US officials and representatives of the Sunni Muslim movement kicked off in the Qatari capital last month. Reports in the US media say that the Americans are now ready to withdraw their troops from Afghanistan in return for a Taliban pledge to no longer provide a safe-haven for al-Qaeda in the country. Read the full story here >> US Troops Out of Afghanistan? TRANSPORT union RMT has secured a major pay victory for DHL staff working on the Virgin West Coast Mainline contract that will see the entire workforce lifted on to a living wage. Read the full story here >> Stop Universal Credit! NONE OF US should be surprised at the collapse of the summit talks between Korean leader Kim Jong Un and Donald Trump in Hanoi last week. Over the past few months the Trump camp had given the impression that they were going to seriously respond to the Democratic Korean call for an end to sanctions and the state of war that still exists between the United States and the Democratic People’s Republic of Korea (DPRK). But at the end of the day the chief American war-lord was unwilling, or possibly unable, to put anything on the table to match the Korean side’s reasonable and balanced stance towards peace and security on the Korean peninsula. In Vietnam Trump told the media that the DPRK was asking for too much. “It was about the sanctions,” he said. “They were willing to denuke a large portion of the areas that we wanted, but we couldn’t give up all of the sanctions for that. Sometimes you have to walk and this was just one of those times”. Now he’s blaming his Democrat foes in Congress for undermining his position during the talks with the DPRK leader.